According to Col. B. R. Lewis in his article, "Meigs and the U. S. Cartridge Co.", published in The American Rifleman (June 1955, PAGE 22); The United States Cartridge Co. of Lowell Mass. was organised in 1868 to exploit Captain Josiah V. Meigs inventions and capabilities, in the growing business of ammunition. Capt. Meigs apparently used these new facilities to the fullest, to try to find a new kind of center fire priming system, and case construction compatible with breech loading, magazine fed firearms. A very FEW, of those known, are shown here. Perhaps for use in Capt. Josiah V. Meigs Magazine Arm, patented in 1866, and holding 50 cartridges, (of about 35mm case length) in the magazine tube, or very probably just as experiments, these are all by the United States Cartridge Co., circa 1868 to 1872, and are unheadstamped, but show light turn marks on the base. 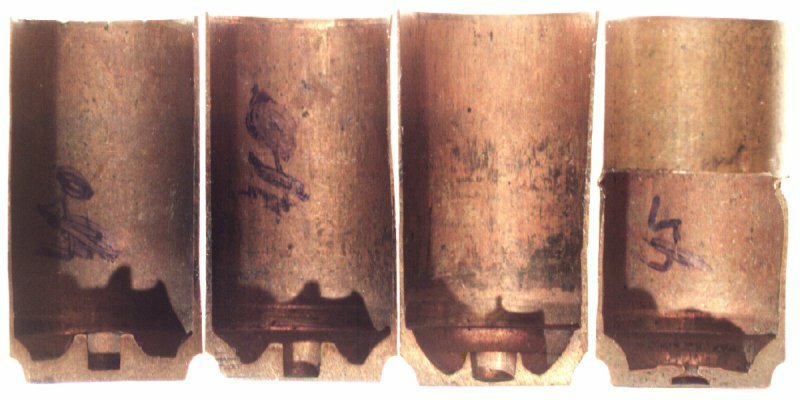 These "headless" drawn copper cases, were manufactured to use an, unknown to me, inside priming system. Left- Scratched by hand into the outside of the case "No 1", "70 2 23", and "4500" in three lines. Right center and right hand cases are unmarked compared to the other two. I have no idea what the hand marked notations mean, but am very willing to be enlightened. The photo is not exact size. The right hand example has a 0.998" / 25.34 mm overall length. In addition to The American Rifleman article mentioned above, there are also Meigs ammunition information and photographs, in Volume 2 pg. 22-27, and Volume 4, pg. 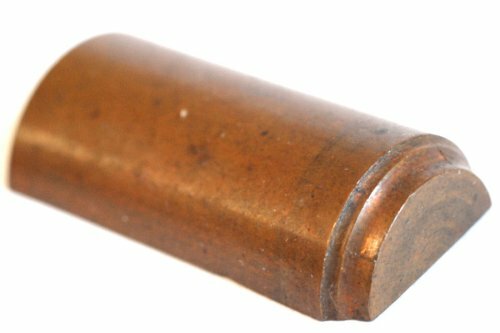 122, of The History and Development of Small Arms Ammunition, by George A. Hoyem. George A. Hoyem, The History and Development of Small Arms Ammunition, Volume 2, pages 22-27 and Volume 4 page 122.